For other people named Kim Jeong-suk, see Kim Jeong-suk (disambiguation). Not to be confused with Kim Young-sook. Kim Jong-suk (Chosŏn'gŭl: 김정숙; Hancha: 金正淑;[a] December 24, 1917[b] – September 22, 1949) was a Korean anti-Japanese guerrilla, a Communist activist, North Korean leader Kim Il-sung's second wife, former leader Kim Jong-il's mother, and current leader Kim Jong-un's grandmother. Kim Jong-suk was born on December 24, 1917 in Hoeryong County, North Hamgyong Province, Japanese Korea. Suh Dae-sook writes that she was "the elder of two daughters of a poor farmer." However, the Korean Central News Agency (KCNA), states that she had a younger brother, Kim Ki-song, who was born February 9, 1921. Kim Jong-suk followed her mother to Manchuria to look for her father, but they discovered that he had already died there. Soon after that, her mother died and she became an orphan. Most sources agree that Kim Jong-suk then joined Kim Il-sung’s guerrilla force in 1935 or 1936 as a kitchen helper. The KCNA, however, reports that Kim Jong-suk and Kim Ki-song joined the guerrilla forces after their mother and their elder brother’s wife were murdered by the Japanese. During this time, Kim Jong-suk worked various odd jobs, was arrested by the Japanese in 1937 in an undercover attempt to secure food and supplies. After her release, she rejoined the guerrillas, where she cooked, sewed, and washed. One day, while the unit was marching under the General’s [Kim Il-sung] command, five or six enemies unexpectedly approached through the reeds and aimed at the General. The danger was imminent. 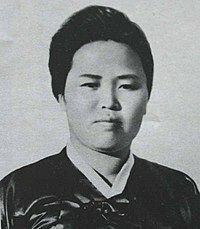 Without losing a moment, Comrade Kim Jung Sook [Kim Jong-suc] shielded the General with her own body and shot down an enemy with her revolver. The General also shot down the second enemy. Two revolvers spurted fire in turn and annihilated the enemy in a twinkle. But this was not the only time such dangers occurred, and each time, Comrade Kim Jung Sook rose to the occasion with fury, and protected the Headquarters of the revolution at the risk of her life. Kim Jong-suk married Kim Il Sung in the Soviet Union, most likely in 1941. On February 16, 1941 (or 1942, sources vary), in the Soviet village of Vyatskoye, Kim Jong-suk gave birth to Kim Jong-il, who was given the Russian name "Yuri Irsenovich Kim," and the nickname "Yura." In 1944, Kim Jong-suk gave birth to a second son, Kim Man-il in Korean and "Alexander" or "Shura" in Russian. In 1946, she gave birth to daughter, Kim Kyŏng-hŭi. Augustina Vardugina, a woman from Vyatskoye, was in her teens when Kim Il-sung’s guerrilla group camped there. She remembers Kim Jong-suk, and how she would come to the village to barter military rations for chicken and eggs. Her son, Kim Jong-il, would be holding her hand. 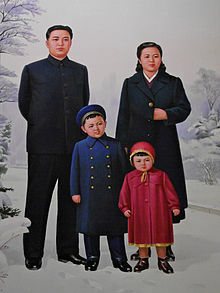 A year after the establishment of the Democratic People’s Republic of Korea (DPRK) and until her death, Kim Jong-suk was the first lady of North Korea. According to some accounts, Kim Jong-suk "was a small, quiet woman, not particularly well educated, but friendly and life-loving." Major General N.G. Lebedev, an executive Soviet officer during the Soviet occupation of North Korea, recalled Kim Jong-suk as "a vivacious and generous lady who always cooked enormous amounts of food for the hungry Soviet generals when they visited Kim’s home." Kim Jong-suk died in Pyongyang in 1949. The official story is that she died from "the hardships she had endured during the years as a guerrilla fighter." The unofficial story is that she died in childbirth while delivering a stillborn child. Her death, however, is omitted from her official biography. Some say she died from tuberculosis, and there are other stories that she was shot and bled to death. After Kim Jong il succeeded Kim Il Sung, he began to make his mother, Kim Jong-suk, into "a revolutionary immortal." This campaign created "a holy trinity known as the ‘Three Generals.’" Instead of touting Kim Jong-suk as the quiet woman that she was, she became the heroine of the revolution. The website of the National Democratic Front of South Korea (NDFSK) says she was "a peerless heroine . . . an anti-Japanese heroine . . . a faithful retainer who faithfully carried out General Kim Il Sung’s [Kim Il-sung] will but also a lifeguard who safeguarded the General of every dangerous movement." Kim Jong-suk was recorded to have "conducted on-the-spot guidance sessions" and was a "great strategist". In her home town of Hoeryong, "a museum, a library, a statue, a square and the house in which she was born devoted to the 'Mother of Korea'". She arranged parachute training and won several shooting competitions. One story says that she would wash Kim Il-sung's socks and dry them in her bosom, or cut her hair and spread it in Kim Il-sung's shoes. Michael Harrold, in his memoir Comrades and Strangers, relates several stories he heard about Kim Jong-suk while in North Korea. According to him, there is a memorial near Mount Kumgang that marks where Kim Jong-suk stopped "when she realized she had forgotten to bring the great leader’s lunch, and had turned back to prepare something to eat for when he returned from the mountains." Kim Jong-suk is also credited with inspiring Kim Jong-il to build the Ryugyong Hotel. Harrold relates that Kim Jong-suk told a young Kim Jong-il that he "must build tall buildings for the people, of 30 or even 40 stories," and the son replied that he would build housing 100 stories high. This led to the construction of a 105-story Ryugyong Hotel, which is still not opened and is nicknamed 'hotel of doom'. On June 1, 2015, the Daily NK reported that Kim Jong-suk's wedding ring had gone missing from Pyongyang's Korean Revolution Museum sometime in late May. Items belonging to key figures of the Kim family are of great importance. In 2010, state television aired a show dedicated to the story behind the ring, which was, purportedly, given to her by Kim Il-sung in 1938 for her role in the anti-Japanese guerrilla movement. Kim Jong-suk is revered as the mother of Kim Jong-il in North Korea. Also pictured are Kim Il-sung and Kim Kyong-hui. ^ a b c d e f g Suh Dae-sook. Kim Il Sung: The North Korean Leader. New York: Columbia University Press, 1988. ^ Kim Jong Suk: Biography. Pyongyang: Foreign Language Publishing House, 2002. ^ a b c d e f g h i Lintner, Bertil. Great Leader, Dear Leader: Demystifying North Korea under the Kim Clan. Chiang Mai, Thailand: Silkworm Books, 2005. ^ a b "Kim Ki Song, Anti-Japanese Juvenile Hero of Korea". KCNA. 25 June 2012. Archived from the original on 2014-10-12. Retrieved 2012-11-20. ^ a b c d e Post, Jerold M. Leaders and Their Followers in a Dangerous World: The Psychology of Political Behavior. Ithaca: Cornell University Press, 2004. ^ Baik Bong. Kim Il Sung : Biography  From Birth to Triumphant Return to Homeland. Tokyo, China: Miraisha, 1969. ^ Lankov, Andrei. From Stalin to Kim Il Sung: The Formation of North Korea 1945-1960. New Brunswick, New Jersey: Rutgers University Press, 2002. ^ a b Harrold, Michael. Comrades and Strangers: Behind the Closed Doors of North Korea. London: John Wiley & Sons, Ltd., 2004. ^ a b French, Paul. North Korea: The Paranoid Peninsula — A Modern History. London: Zed Books, 2007. ^ "The great Mangyongdae family." ^ Kang Mi Jin (June 1, 2015). "Hunt on for missing national treasure". Daily NK. Retrieved June 7, 2015. ^ "Wax Replica of Kim Jong Suk Displayed." KCNA. 26 April 2012. ^ a b c Yang, Ryon Hui (5 May 2012). "Wax sculputure dedicated to grat woman". Pyongyang Times. George Washington University. p. 4. Kim Jong Suk Biography (PDF). Pyongyang: Foreign Languages Publishing House. 2002. OCLC 68966128. Kim Hye-hui (1997). Kim Jong Suk: Mother of Korea. Pyongyang: Korea Pictorial. OCLC 242955596. Kim Ik-hyon (1987). The Immortal Woman Revolutionary (Three vols.). Pyongyang: Foreign Languages Publishing House. OCLC 17944056. Kim Ok-sun (1997). Kim Jong Suk: The Anti-Japanese Heroine (PDF). Pyongyang: Foreign Languages Publishing House. OCLC 659903802. Wikimedia Commons has media related to Kim Jong-suk. This page was last edited on 20 April 2019, at 20:37 (UTC).